Bacon contains a saturated fat, which can increase the risk for cardiovascular disease. Bacon can also raise blood pressure, contaminate breast milk with flame retardant chemicals, increases the risk of COPD, acute myeloid leukemia, gout, and gestational diabetes during pregnancy, and may decrease lifespan. Even the fumes from cooking bacon may have carcinogenic and other disease-causing effects such as DNA mutation and postmenopausal breast cancer. The vacuum-packed bacon containers need preservatives and bacteria inhibitors such as harmful nitrites. 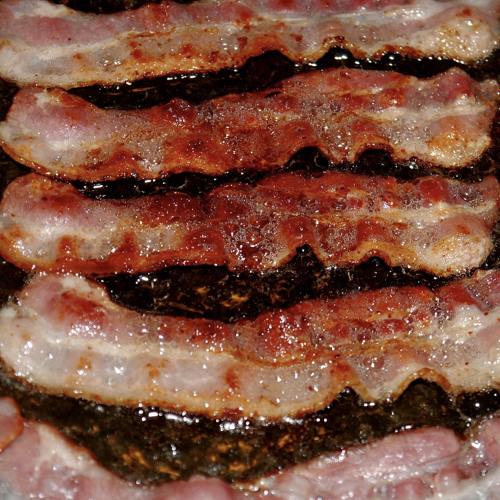 The vitamin C added to “enrich” bacon arereported to make them even more carcinogenic. Reducing bacon consumption and increasing plant food consumption may reduce cancer risk in part because plants tend to have significantly more antioxidants than animal products such as bacon.